In the U.S., currently thousands of veterans are being declined from receiving services from the Department of Veterans Affairs (VA) in response to their health issues or injuries while being on duty. Many are told their diagnoses are not severe enough to receive treatment in a prompt manner, or at all. With their diagnoses ranging from disabilities to Post Traumatic Stress Disorder (PTSD) – rejection from receiving VA benefits is becoming more and more common. As a result of veterans not receiving the type of care they need as quickly as they need it, many are finding it hard to cope with their challenges on their own. Before finding FSL, life was very difficult for Manuel – a Vietnam Veteran who lost his leg during battle. Due to this, he is now confined to a wheelchair and is blind from one eye. He struggled for quite some time to find comfort in the VA system after being turned away multiple times, because his injuries were said to not be significant enough to receive treatment at the time. While facing this tough battle on his own, his support system – his wife, was battling cancer and was not able to provide him with the care he needed. They did have a caregiver who would visit their home, but only saw her a few days a week and her services were limited. As Manuel and his wife were becoming more and more reliant on the help of their caregiver, she became less and less available and her at-home visits began getting shorter. Something needed to change for them – fast. After being turned away from the VA, Manuel sought guidance from the Arizona Veterans Stand Down Alliance, a program of the Arizona Housing Coalition which allows Veterans and their families who are experiencing housing instability and homelessness to get and stay connected to supportive services. 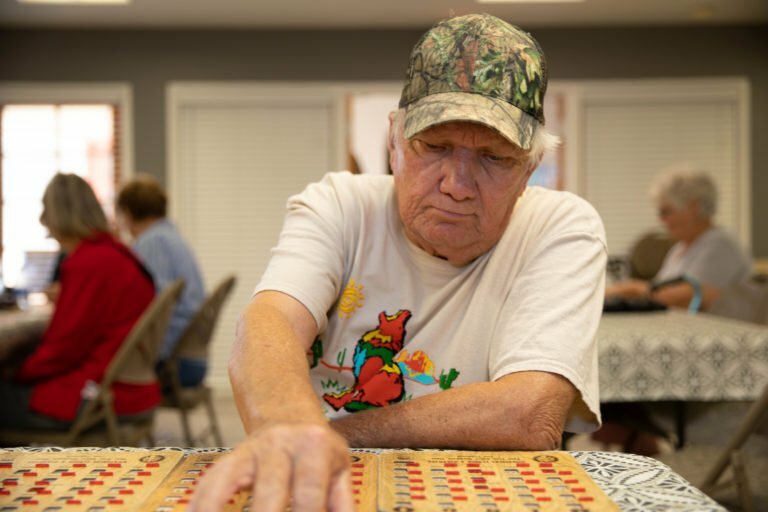 That is where he learned about FSL’s programs and services, specifically about Home Health and Home Care – which he and his wife both needed the most. He was told FSL’s registered nurses conducted home visits on a regular basis, and although FSL has been a trusted organization for over 40 years, Manuel did not believe he would actually see anyone reliable. After contacting FSL, Manuel received a home visit the very next day from Gail, a certified nursing assistant from FSL’s Home Health department. Manuel was in disbelief at the fact that he was finally receiving what he had been asking for all along, a chance to be heard. During his first visit with Gail, Manuel received his first thorough shower in weeks! Shortly after Gail and Manuel were able to cover a few grounds for treatment, Sheri – a registered nurse arrived to help with his medications and immediate health needs. Manuel began to find comfort in the services FSL’s staff was providing to him. Gail would come by his home 3 days a week, Sherri would visit twice a month, and his housekeeper Olivia would tidy up the house once a week. The staff soon became his family, they even spent a couple hours together on some holidays if visits took place. “FSL has definitely been the turning point in my life thus far; I’m tremendously thankful for everything they have done for me. I was almost running out of hope.” Manuel said. FSL truly cares about all clients if you or someone you know is facing challenges while searching for the care they need, have them contact FSL. We have staff dedicated to your health. For more information please call us at 602-285-1800.